In a tight series, errors are magnified and the obvious difference that separated the sides was goalkicking. Quite simply, had Beauden Barrett kicked more accurately in the second and third Tests, New Zealand would have been victorious by a score of 3-0. This was a tour for the ages and after copping a pasting in the first Test, the Lions did tremendously well to level the series and then hang in for a draw in the deciding match. Yes, I say hang on because that is what it felt like for much of 80 minutes. New Zealand always looked the more likely but crucial handling errors and errant goal-kicking meant the Lions managed to stay in touch. The Lions won their fair share of possession but did not really threaten the All Blacks’ line. On the one occasion they came close, a cut out pass to Watson was intercepted by Beauden Barret. The All Blacks’ trademark clinical finishing let them down with Savea dropping the ball when all he had to was catch it and canter over the try line. There was also a forward pass that prevented a simple try for Savea. It took two pieces of magic to ultimately break the resolute Lions defence. Seeming as though they had done this for a lifetime in the backyard, Beauden Barrett send a precise cross-field kick allowing Jordie Barrett to jump for the ball and in one motion catch and then pass the ball pack to his support player in Ngani Laumape. The devil is in the detail – firstly Barrett showed vision to spot the kick and the potential mismatch, although I think my blind uncle would have spotted that, such was the space out wide. The kick was high enough which allowed Jordie Barrett to jump at the ball and left Daly stranded as he was unable to tackle the player in the air. The catch and pass from Jordie Barrett was pure magic and the support play from Laumape was excellent. The second try came off the back of a set piece where Laumape took it hard through the 12-13 channel before releasing a wicked offload to his support runner in Leinart-Brown who set up an easy score for Jordie Barrett. The game was punctuated by numerous errors and meant that neither side really gained any real momentum. But high stakes matches are a war of attrition. Knowing there would be no tomorrow, the forwards pack smashed into each other for 80 minutes. It was an even contest, the gainline statistics were even, offloads were close and the support play and clean-out work was outstanding throughout. The scrums were a ripping contest but being even for most the of the match, the entrance of Kyle Sinckler seemed to shift the balance in New Zealand’s favour. Sinckler conceded one penalty that lead to a try. It seemed as if he was scrummaging on ice, frequently collapsing and he was lucky not to give up any further penalties. The lineout was a win for the All Blacks, their try came off the back of the lineout and was solid throughout winning 100 per cent of their own throws. Jamie George was penalised on several occasions for errant throws and prevented the Lions from getting momentum off the back of attacking lineouts. For the third Test in a row, neither side managed to use the maul as a weapon with the respective maul defences bringing down the ballplayer or managing to halt progress before metres were gained. The tactical kicking game from both sides was fascinating to observe. Connor Murray used to his box kicks to get the Lions repeatedly out of trouble, gaining territory and giving his team a breather in the process. The undoubted highlight though was the tactical kicking exhibition put on by Beauden Barrett. I have mentioned his cross field kick already that lead to a try but there were several other gems, particularly when the heat was on in the last quarter. Time and time again, he found touch in the Lions 20 or was able to place the Lions back three under pressure. Ultimately, the difference was kicking for goal. The Lions were perfect in this respect. Elliott Daly landed a monster kick from his own half to give the Lions early momentum in the second half. The Farrell kick to level the scores with four minutes to go was one of the great moments of the series. It would have been the biggest kick of his life and it was not an easy one being 45m out but he managed to scrape it over the bar, sending Lions fans into pandemonium. 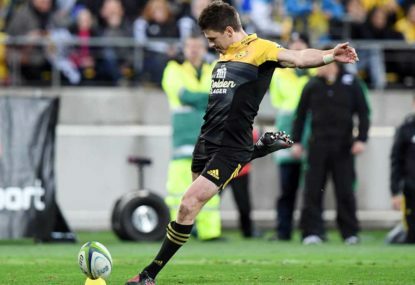 It is hard to be critical of Beauden Barrett but his goal-kicking errors were the difference in the end. I can recall the first Test where the UK Sky commentators repeatedly referenced Barrett’s main flaw being goal kicking – he proved them all wrong with a superlative performance. But since then he has had his struggles, he kicked 69 per cent in the second Test and 50 per cent in this Test which included missing a relatively straight forward conversion. The importance of a brilliant goal kicker cannot be understated and in the post-Carter era, the All Blacks found that out that the hard way with Barrett squandering golden opportunities to complete a series victory.